My vague recollection of why I hate gummies has a lot to do with the texture – endless chewing – which gets you nothing more than an artificial chemical taste. These are nothing like what I remember. They’re a bit chewy, yes, but really fairly soft. And the fruit flavors, which are supposed to be cherry, lime, and strawberry, are nice. I’m not a big fan of the lime, which I find unappealing in most candies. But all three are decent, not too sweet with just a little bit of tartness to keep them perky. They are made in France, which is well known as a home of high quality confections, but gummies? Maybe gummies in general have improved since I gave up on them, uncounted candy-eating years ago. Whatever the explanation, they didn’t last long enough for me to get around to buying a plastic marine predator to stab them with. My only objection to these is that they don’t look as much like penguins as I’d hoped. You can see in the picture that they have odd little smiles on their faces where they ought to have beaks. But while you’re playing with the juicy bellies – and eating them up – you probably won’t even notice. Your idea of “gummies” sounds more like my idea of Jujube, Jujyfruit, DOTS, and some Gumdrops (and about 1 brand of Gummi Bears out of the 100′s or so that are out there now). I love soft gummies that have fruity flavors… the hard and extra chewey one give gummies a bad name! The “penguins” look like smiling Grimices (McD’s TM)… or happy fat kids. Ha ha. What a hoot! 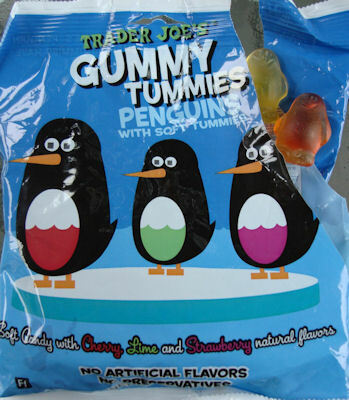 I’ve never cared for gummies either but I just might have to give these a try. Update: gummy tummy penguin vs narwhal!